This was the selection for my book club way back in June. I listened to it, but when it came time for the meeting, Clark was less than three weeks old and my mom was visiting from Colorado, so I decided not to go. But . . . I had found it such an eye-opening read that I still wanted to have a discussion about it. So I suggested it for the book club during my family reunion last month. I think my mom and I had at least two phone conversations and probably two more face-to-face discussions about the book before the whole family officially convened around the campfire on a Thursday evening. There was just a lot to talk about. 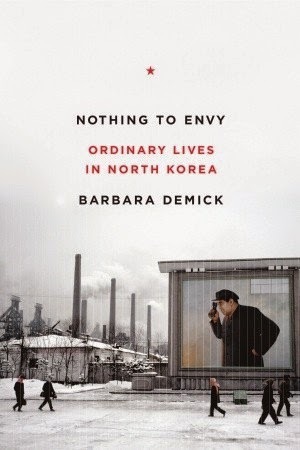 In Nothing to Envy, Barbara Demick (a journalist for the Los Angeles Times) tells the story of six North Korean defectors. There's Mi-ran, the youngest of four daughters who works hard to become a teacher; Jun-Sang, the eldest son in a privileged North Korean family (and Mi-ran's boyfriend); Mrs. Song, a middle-aged woman whose loyalty to Kim Il-sung and Kim Jong-il is flawless (up until she decides to defect, that is); Oak-hee, one of Mrs. Song's grown children who initially defects to escape a bad marriage; Dr. Kim, a medical doctor who is expected to perform miracles with the barest of supplies (and in the end, she can't even save her own father from starvation); and Kim Hyuck, a "wandering swallow," whose family had died and left him to care for himself. Through the eyes of these different, but very ordinary, citizens, we catch a glimpse of what it's like within that darkened country. The book begins with that famous aerial image of a dark spot in the middle of a sea of lights. My younger sister recently had the opportunity to visit South Korea. (When she was seven months old, my family adopted her from South Korea. She is now fifteen, and my parents wanted her to have the experience of visiting the country of her ancestry and birth). Before her trip, she and a friend were looking at a map of South Korea, and, without knowing anything about North Korea, asked why the spot next to it was so dark. I don't think the complete contrast between those two countries could be any more striking than looking at the map. The difference is literally black and white. I originally assumed the book's title was in reference to the world's view: when it comes to North Korea, we have nothing to envy. And, in part, I'm sure this meaning was intended. However, what I didn't know was that these were actually words taken from a North Korean propaganda sign (and song), "We have nothing to envy in the world." One of the most haunting moments from the entire book is when a little 7-or-8-year old homeless boy in a too-big workers party uniform is singing those words on a train platform. How absolutely tragic that he, of all people, could be singing that he has "nothing to envy." However, I think the thing that surprised me the most about these stories is that the isolation of the North Koreans could be so thorough and complete that they have absolutely no idea what life is like just a few miles away in South Korea. It kind of gives me the creeps. Do you know what I mean? Like, what if what is being presented to myself as truth is actually one enormous lie? Because essentially, that's what is happening to North Koreans. This isn't the kind of book you'll read if you want to feel good about the world we live in (in the words of my brother, "this is a depressing book"). Even for the Koreans who escape the regime, life is far from happy (many of them had to leave family behind, and in the case of Mi-ran, the ones still in North Korea suffered grave consequences). But it is one of those books that will open your eyes just a little bit more and help you remember your blessings and inspire you to help the people you can. After the reunion I suggested that interested people might want to watch the episode of PBS's Frontline series entitled "Secret State of North Korea" which shows a lot of the same things documented in the book "Nothing to Envy". The URL is below. I read this book a few years ago, and while the details have largely faded, it left a deep impression on me. When I read about dictatorships and totalitarian regimes like this one I always wonder at the fact that the people don't just band together and overthrow the government, but I also know that these types of governments are really good at instilling so much fear and suspicion and hopelessness in the people that they feel powerless to act. It's so scary. I read this a year or so ago....talk about bleak. And a book that makes one profoundly thankful.